This add-on enables csv export functionality of the tickets. It exports all fields available for ticket list (even it is not set in list) but not others like attachments, description, replies etc. Export all ticket based on current filter set in ticket list so that if you want only particular tickets to export, it is possible and if all required, simply do not apply any filter. You can decide Support Agent Roles to have this feature enabled. Also, there is option available as All User if you want export tickets feature available for users. 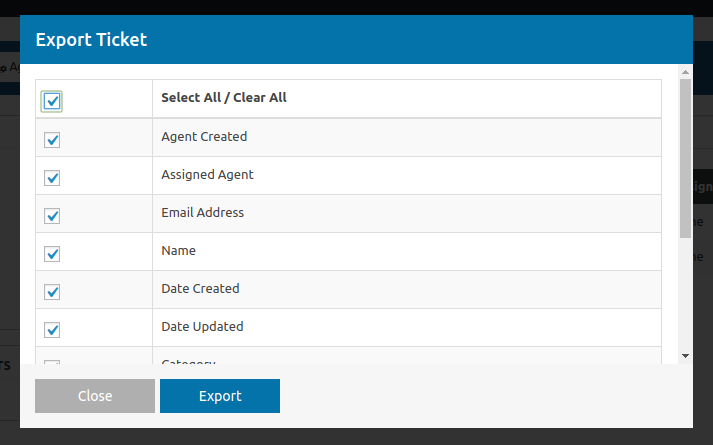 It exports only accessible tickets of logged in user so that agent can only export tickets accessible to him, user can export only his tickets, administrator can export all tickets, etc. Extensions subject to yearly license for support and updates. You can continue using add-ons even after license key expired but will not get support and future updates from us.